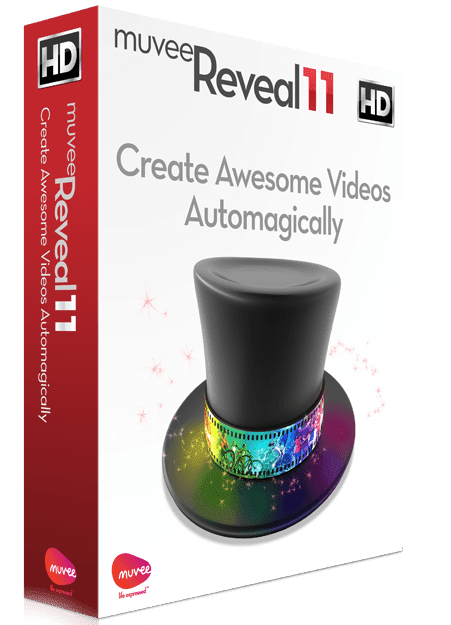 muvee is the creator of automatic video editing software. Since 2001, we've been making software that allows you to create awesome videos from your photos and video clips in just 3 steps! Upload your files, select a Style that includes transitions and effects and music (or select your own track!) and hit PLAY! That's it. All the hard work is done for you. In one click upload to Facebook, YouTube or burn to DVD. We have Styles that are more sophisticated and nostalgic for sentimental anniversary videos and fast and fun for family vacations or kids sporting events. muvee Reveal 11 retails for $79.99. We had professionals create a bunch of Trailer-style Title complete with its own short music tracks. You have the option of nominating 4 photos to be featured, along with mentions of the Director, Star and Producer. We also automatically create a billboard for each of your muvee project. Go on, be the star, or be the director. Or better yet. Be both. Start with a Style you like as a base. 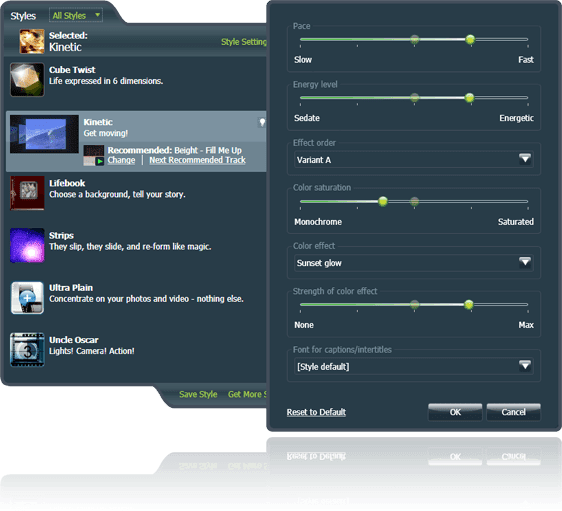 Then add your own ingredients from setting a faster pace, to selecting a color filter, to even changing the default font and background colors. When you are done tweaking, save your unique recipe and give it a new name. Voila! Your very own Style. Found in the photo options drop down (right click on any photos), you can now add stickers to photos. Choose from many categories of stickers, from frames and borders, to hand drawn embellishments, to even light sparkles, fireworks and cute stickers for kids. You can then save a new photo with these embellishments for Facebook before using them in your muvee slideshow. Now you can tell muvee Reveal how you want it to prioritize your videos and photos and music. We have redesigned all these controls into a single page where you can simply tick the boxes and make very different edits instantly. Started your project in school or in the office and you want to continue editing on your home PC? Are you collaborating on a joint trip video? Now you can zip up all the photos, videos, and music content along with all settings, captions, intertitles and every imaginable detailed setting of your projects into a single file, and continue where you left off on another machine. Now you can select images directly from your video clips and save! Want to submit a photo for the GoPro Photo of the Day competition? Or simply to post on Facebook? Import a video, and take snapshots of any frame in the video instantly by clicking “Capture”. Oma found muvee Reveal 11 very user friendly. Literarily, less than a half an hour after downloading and install the software, the video below was made and saved to Oma’s desktop; not bad for a ‘video challenged’ writer! Oma also marveled at muvee Reveal 11 capability to allow the user to decide how much customization they wished to exercise. You can simply upload your photos and let the program do all the work or you can spend a few moments to tweak the music, photo order, color . . . . The giveaway is open to residents of the U.S., 18+. No P.O. Boxes will be accepted. The giveaway will run through 8/18/14. Winner will have 24 hours to respond to winning email before a new winner is selected. Make sure you are properly entering for the entries you claim. Failure to do so may result in your entries removed from the giveaway form. I learned this software has the ability to add Cinematic Titles, Collaborative Editing, Photo Enhancements. I like that you have 30 days money back guarantee so you can see if that is for you and not have to commit. They have licensed music you can use to put on you video - pretty cool! I learned that they have a money back guarantee and that and that "voice Over" can be done. Reef Indy's New "Brain Bucket"
Gosh really this was over 40 years ago!? !